There is something wrong with almost every aspect of Magic 2014: Duels of the Planeswalkers. Whether it’s the campaign, multiplayer, the new sealed mode or even the puzzling challenge mode, it’s hard to play the game without noticing things that simply could have been done better. The series is supposed to be the perfect starting point for players new to Magic: The Gathering while also providing enough depth to keep veteran players entertained for hours on end, but sadly, it does a good job of neither. For new players there is a tutorial that is capable enough and guides them through learning the game’s basics. But once the tutorial is over, they are thrown to the wolves. Upon starting the campaign, the first three games are not normal matches, but encounters against pre-stacked decks. 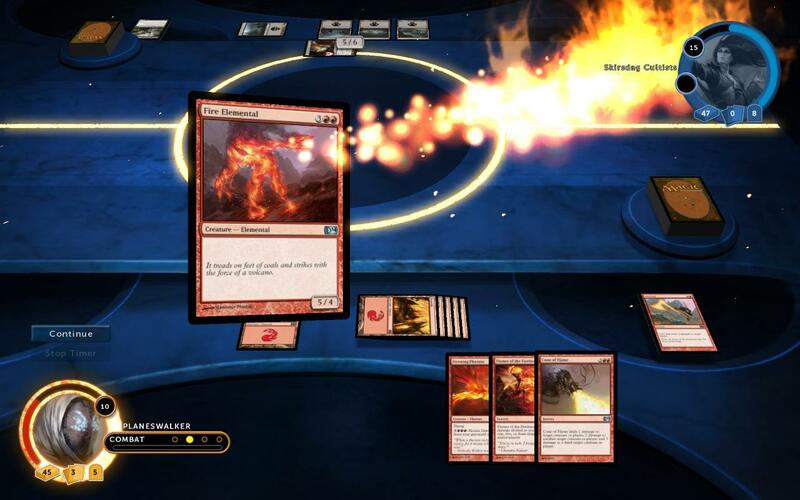 The computer is given a specific set of cards in a predetermined order and the player has to attempt to overcome whatever combination of cards happen to be the theme of the encounter. Although technically it plays like a normal game of Magic, there is nothing about these encounters that remotely resembles a real game. It’s obvious that they are in the game as a method of padding out the pathetically short campaign. Assuming new players manage to win the three encounters, the next battle and first true match is against what is arguably the most powerful deck in the entire game. 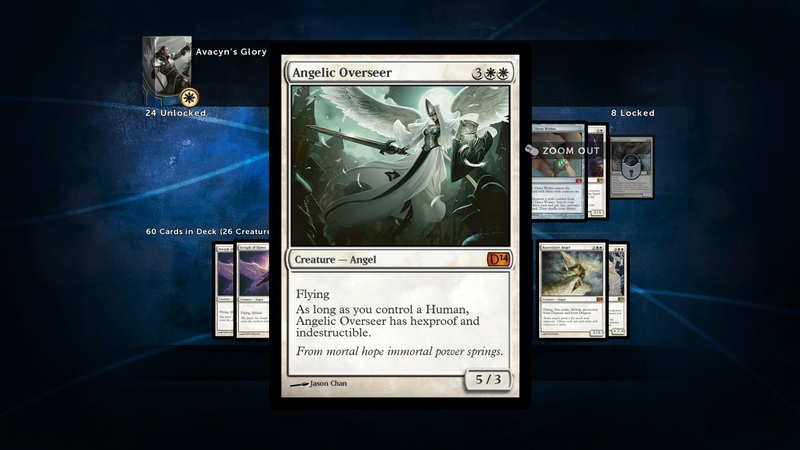 Avacyn’s Glory is a white deck that’s all about humans. Most of its cards work together in synergistic harmony so that even a few weak humans can turn into something surprisingly powerful for the early stages of a match. Then Angelic Overseer shows up. The deck also has powerful removal cards like Path to Exile, Fiend Hunter and Oblivion Ring, which the A.I. uses to suddenly reverse the match’s momentum. Facing off against Avacyn’s Glory is no joke, and I can’t begin to fathom why they placed that match so early in the game. It could not have been for the sake of the storyline. Despite a lot of pre-release hype about Magic 2014: Duels of the Planeswalkers and its new and improved story mode, the plot adds virtually nothing to the game. Apparently a few computer animated scenes are supposed to convince us to care about why a Planeswalker named Chandra has to defeat another Planeswalker called Ramaz. The story is barebones and feels like an afterthought. Aside from the movies, the rest of the story comes through a couple paragraphs of spoken dialogue. Each time you select one of the game’s Planes (one of the many worlds in the Magic: The Gathering multiverse) you get to hear Chandra read a paragraph about why you are there before you select one of the three encounters or the match you want to play. It’s barely interesting the first time and becomes downright annoying upon repeat visits to the Plane, which are very likely to occur considering it’s wise to visit the deck manager in between matches. Like in previous games in the series, every time you win a match in Magic 2014: Duels of the Planeswalkers you unlock a new card for the deck you won the game with. And just like in years past, the card is automatically added to your deck, whether or not you want it to be. Since a poorly chosen card can upset the balance of a deck, many players like me will feel compelled to visit the deck manager after every single game, either to remove the unwanted card or to swap out another card for it if it happens to be useful. It definitely upsets the flow of the single player campaign, and I’m amazed that this problem still exists after 4 games in this series. Fortunately, the deck manager has been improved in this iteration. Each deck starts with 60 cards, with about 40% of those being mana producing land cards (mana is required to cast spells in Magic: The Gathering), so really, there are about 36 non-land cards available for each deck by default. For the first time in the series, the player is able adjust the deck’s land balance manually, so at least that one item from my wish list was realized. In addition, the cards that are not currently in the deck can be sorted according to rarity, type, color and cost. Sadly, the deck itself is always sorted by cost and that cannot be changed. There is also a useful chart that displays columns alongside numbers from 1 to 6+ which represent the converted mana costs of the spells in your deck and how many of each are present. The game also supports another chart that shows how many of each spell color are in the deck, but for some reason that does not appear in the main deck manager—it only shows up in Sealed mode. And speaking of the elephant in the room, Sealed mode is a total fiasco, which is a shame considering the brevity of the main campaign. That, by the way, consists of 15 encounters, 5 proper matches, 5 optional matches (that can be unlocked one at a time each time you clear a Plane) and 1 boss match at the end. There’s also a Revenge campaign where you play against better versions of the 11 decks used in the main campaign, which admittedly adds some replay value. But when you’re done playing against pre-built decks you’re likely to want to spend some time with the most anticipated feature of Magic 2014: Duels of the Planeswalkers: Sealed mode. It should have been the feature to finally bring veteran Magic: The Gathering players on board with Duels of the Planeswalkers. Instead, it’s the biggest disappointment in the entire game. The way Sealed mode works is you pick one of your two save slots and open a series of booster packs. The booster packs contain random cards that come from very small set of 151 cards, and the cards you draw become the collection you can use to build a deck for that one save file. Once you have built a 40 card deck, you can either play the single player Sealed campaign or challenge other players online. The campaign provides the opportunity to unlock a couple more booster packs. It consists of a series of 6 matches, but once again the feature fails to live up to expectations. The decks you play against in the Sealed campaign are not formed each time you play, but are instead pre-designed single color decks. While it can be challenging and fun to attempt to overcome these unfair matchups, it contradicts the very point of Sealed mode, which is to play with a deck constructed from freshly opened boosters and battle against other decks built the same way. 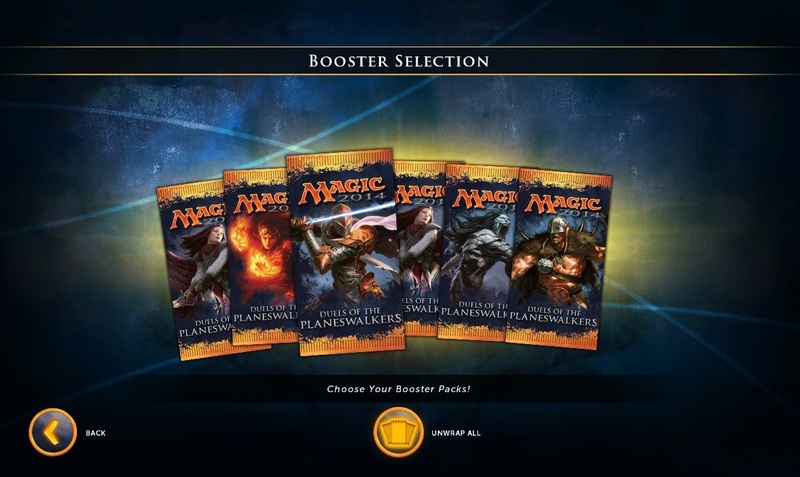 To make matters worse, once you have completed the campaign, if you want to play again with a fresh set of boosters, you have to select a different save slot. There is no way to delete an existing save file, and you are only given two slots. Once they are filled, your only option if you want to play Sealed mode again from scratch is to buy additional save slots for $2 each. Personally I consider this an unethical bait and switch since Sealed mode is advertised to be included with the game, but essentially becomes unplayable after two games. Perhaps the developers think that we should continue using our existing Sealed decks over and over again, but once again that contradicts why Sealed play is fun. When playing with real cards in a Sealed tournament, once the tournament ends, there is little point in keeping the deck. The majority of decks built for such tournaments are disassembled afterwards. If only that were possible in Magic 2014: Duels of the Planeswalkers. Instead, our only option to try to get a little more value out of Sealed mode is to play online, and that’s where things get even worse. The most obvious problem is that if you happen to get bad cards in your packs, you are unlikely to be able to compete online against luckier players. On the other hand, if you got great cards, you might win every single game. In either case, it isn’t much fun, and it just emphasizes further that the point of playing Sealed was completely missed by the developers. Things go from bad to worse when hackers come into play. Unfortunately, it is possible for hackers to customize decks in Sealed mode with no limitation. Needless to say, this breaks the game completely. Forget about attracting veterans to the game, I can’t see a reason that anyone should bother playing Sealed mode in Magic 2014: Duels of the Planeswalkers. So the campaign is short, Sealed mode is a disaster… what’s left? Let’s see… there’s a Two-Headed Giant mode which is a 2 versus 2 format where the players in each pair play simultaneously and share 30 points of health. Oh! And challenges are back. There are ten challenges in this year’s game, and either I have gotten much better at magic or they have become a lot easier. I got through nine of them in a matter of minutes. The only one that was really tough was the last challenge, and that was one of those puzzles that was only hard because it forced you to work with cards buried somewhere in the deck. It’s impossible to solve that puzzle just by looking at the cards in your hand and what’s on the battlefield. I hate puzzles that require more guess and check than actual strategy. In any case, don’t expect the challenges to hold your attention for long if you’re an experienced player. I wish I could say that’s the end of the bad news, but there’s more. A variety of other annoyances appear throughout the game. When playing against the computer, the A.I. often takes an absurd amount of time to play. Sometimes it will take a minute or two before it decides to do nothing and end its turn. And when the A.I. knows the situation is hopeless, it starts behaving very oddly, as though it feels compelled to use every card in its hand before the end, even if that means attacking its own creatures. Also, on occasion, the A.I. fails to use certain cards such as Terramorphic Expanse, a simple land fetching card. Another problem is that there is a lack of balance between the ten decks. As I mentioned before, the human deck is very powerful, but there is also an unusually underpowered dragon deck that is barely playable. Even the A.I. doesn’t know what to do with it. More often than not when I face off against that deck, the game ends before a large dragon even comes into play. There is usually some degree of imbalance between the decks in these games, but it seems to be more prevalent this time around. Finally, the multiplayer experience leaves much to be desired. I have yet to successfully join a Quick Match. Instead, clicking Quick Match leads me to a loading screen that cannot be escaped from or canceled. The only way to get back to the menu is to wait for it to time out. I had to create my own custom matches in order to be able to play online. If there’s one saving grace, it is that visually, this is the best looking game in the series. The main menu is easy to navigate and gameplay is attractive and clean. They even animated the artwork on some of the most powerful cards in the game, so be sure to zoom in and get a good look at them! The only problem is the Campaign interface. It’s kind of silly that in order to play the optional matches you have to first click on a Plane and then click on a separate button to get to the list of decks you can play against. There are a couple of other positives as well. I enjoyed playing with most of the decks in the game, and it’s great to see the hive-minded Slivers make their Duels of the Planeswalkers debut, bringing with them their built in synergy longtime players know and love (or hate). There’s also a deck full of Illusions that seems pretty weak at first, but turns out to be quite formidable once certain cards are unlocked. Really, the main thing to keep you playing Magic 2014: Duels of the Planeswalkers is the same thing that’s kept you playing since the beginning of the series. Despite its countless flaws, it is still a bargain priced title that includes 10 decks with 30 cards to unlock (more with promo codes). That, in and of itself, is a great deal of Magic: The Gathering for only $10, especially when you consider that a single pre-built real life deck will cost you around $15 in stores. Yes, it’s disappointing that Sealed mode turned out to be such a colossal flop, especially since it represents the first time players have ever been able to build their own decks in the series. But when all is said and done, if you have enjoyed Duels of the Planeswalkers in the past, you will enjoy it again. If you’re new to magic, the tutorials should be enough to get you going, even if the going gets tough afterward. So yes, regardless of this essay of disappointment, I still recommend it to fans of the series and newcomers alike. Just don’t go into it expecting anything from Sealed mode or hoping for any kind of decent storyline in the campaign, and you should be okay. Ari has been a fan of Magic: The Gathering since 1995. He played 46 hours of Magic 2014: Duels of the Planeswalkers and earned all 30 achievements. He did not receive a copy of the game for review purposes.